After changing gears recently, the nation’s previously slowing price positioning is now bearing gently northward. 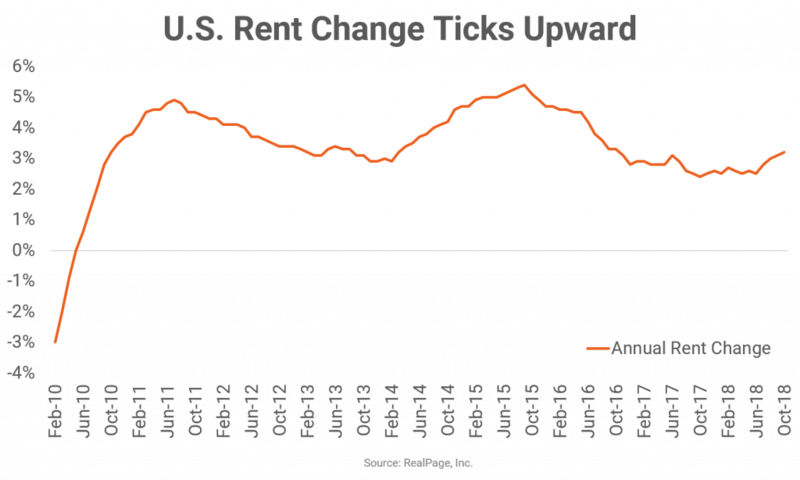 According to monthly data released in October, that rent growth trend continues to strengthen at a mild pace. U.S. apartment rental rates climbed 3.2% year-over-year as of October, marking the fourth consecutive month of slight upward momentum. Previously, rent growth peaked in September 2015 at 5.4% before trending downward for nearly three years. Starting as recently as July 2018, however, prices started easing upward once again. As of October, national rent growth was at its strongest point in two years. Among the nation’s largest 50 apartment markets, five recorded price increases above the 5% mark in October. All of the top five were West Coast or Florida markets. Las Vegas remains the nation’s rent growth leader, with a year-over-year increase of 7.3% in October, up 10 basis points (bps) from the September reading. Sin City hasn’t seen rent growth at this level in at least a decade. In fact, until recently, Las Vegas price positioning ran notably below the U.S. norm. It wasn’t until August 2014 that rent growth in the Nevada market pushed ahead of the national average. Since doing so, however, price positioning in Las Vegas has averaged at 6.1%, while the U.S. average has been much lower at 3.7%. Ranking second among the largest 50 markets, Phoenix rents climbed 6.9% year-over-year, 20 bps above the September increase. This is the strongest rent growth Phoenix has seen since the recent peak recorded in the middle of 2016. It’s been a good year for the Phoenix apartment market, which logged some of the strongest demand volumes in the country during 2018’s prime leasing season, spurred by a quickly growing employment base. Jacksonville logged annual rent growth of 5.4% in October. Though that increase was a slight 10 bps below the September reading, it’s still quite an achievement for this Florida market to make the top five list. Rent growth in Jacksonville rarely reaches above the U.S. average, but prices here started making big moves in June 2017, and hikes have been between 4% and 6% since. 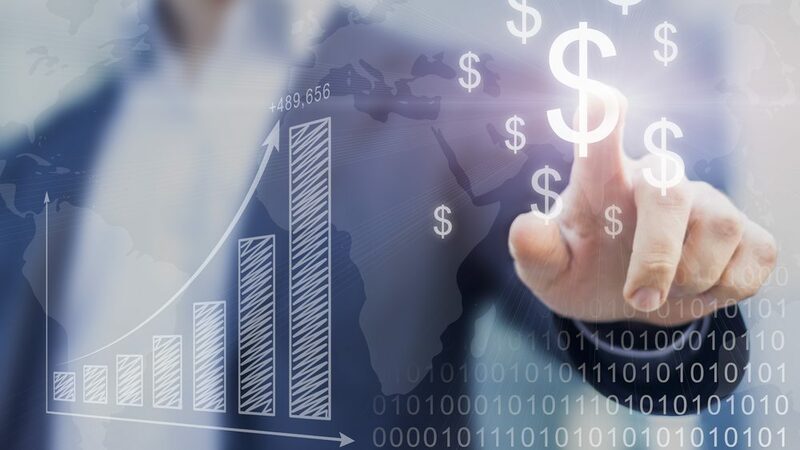 Jacksonville also recorded a recent economic boost, along with a handful of other Florida markets, due in part to a post-hurricane employment surge. Orlando has been enjoying quite a rent growth run in recent years. While price increases in this market suffered a setback of 110 bps between September and October, year-over-year rent growth remained strong at 5.3%, a pace well ahead of the norm for this area. Price increases in Orlando have historically run essentially in line with the national average, but the market started pulling ahead in 2014 and has since pushed rents consistently ahead of the U.S. norm. In fact, in the past 12 months, year-over-year rent growth has averaged at a hefty 6.1%. Representing the expensive California markets, San Jose’s year-over-year rent growth was at 5.2% in October, up 30 bps from the September figure. Unlike some of the other markets on this list, San Jose is used to being at the top. During the first five years of the current economic cycle, San Jose’s average rent growth was at 8.1%, well ahead of the national norm of 3.5%. In 2016, however, the Bay Area market started seeing rent change move downward, bottoming out in September 2016 with price cuts of 2.4%. Since then, rent change has recovered steadily, pushing ahead of the national average again by September 2017. A handful of markets logged solid rent growth improvement of 50 bps or more between September and October, including Providence, Oakland, Greensboro, New York, Austin and Seattle. The most impressive of these was Austin, as recent growth marks the ninth consecutive month of improvement for this market. Like Phoenix, Austin saw notable demand in prime leasing season this year. Inspiring absorption, Austin has logged strong employment and income growth, while supply levels have remained reserved in recent months, leading to a solid performance, especially in the urban core submarkets. On the other hand, Houston suffered the worst hit among the top 50 markets, with rent growth dropping 190 bps between September and October. This was the second consecutive month of steep pricing setbacks, putting Houston at the bottom of the performance spectrum with year-over-year rent growth of just 0.6% as of October. This marks quite a change for Houston, where price increases were sizable between about 4% and 5% between November 2017 and August 2018. Making continued national rent growth possible, occupancy trends have been strong recently. While occupancy in the U.S. apartment market eased a bit between September and October, following a normal seasonal pattern, the rate remains strong at 95.5%, up 40 bps year-over-year.